Simply put, Feng Shui is about how energy moves through rooms. The practice of Feng Shui, meaning “wind” and “water,” focuses on arranging things in rooms, based on their energies, to bring focus, balance and clarity to our metaphysical places. The basics include removing all clutter, especially around entryways, to avoid creating blockages. Additionally, the presence of living things (plants, animals, fish) increases positive energy. And light and music are important factors in establishing calmness and clarity. To begin, the Bagua, an ancient Chinese term means “eight areas” (“ba”=eight, “gua”=area) and Feng Shui bagua is a map or chart (pictured here) that relates the various areas of your life to the 8 sections of your living space. These eight main sections of a space are represented by what are known as “guas” of the bagua map. 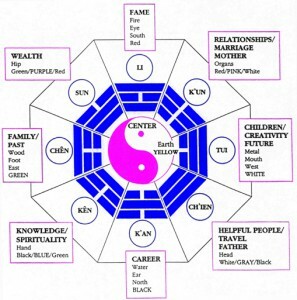 The bagua map can also have a ninth center section that corresponds to the 9 major corresponding life areas. 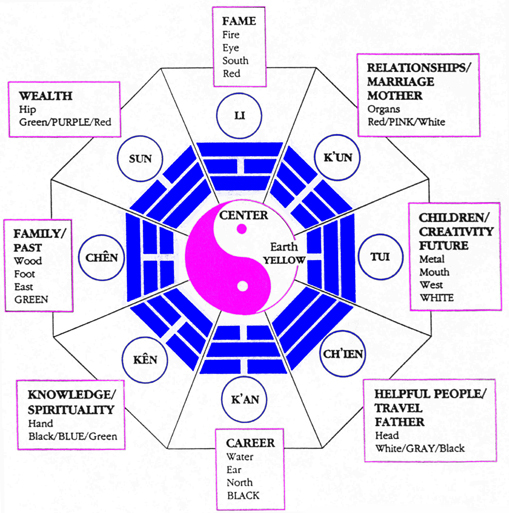 So in this way the layout of bagua map shows the nine main energy centers that we value most. The map is used by placing it over a floor plan of the space being designed or fixed for problems . With the help of the map, users can learn how to pinpoint the areas that need our immediate attention so that they can be enhanced by Feng Shui practice. A friend of mine, Maureen Calamai, the founder of Luminous Spaces, will help you create a more positive environment in both your home and office. Feel the Power of Feng Shui!